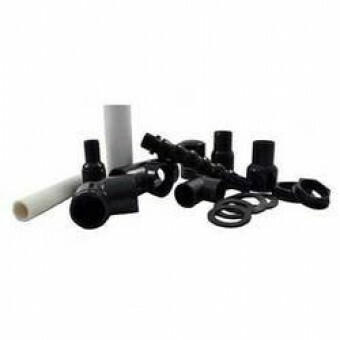 Universal reef ready plumbing kit. Fits all overflow pre-filter systems which accommodate 1" and 3/4" bulkheads. Bulkheads equipped with double gaskets! Includes: Drain & return pipes. 1-1/4 " to 1" reducer fitting. 3/4" elbow fitting. Adjustable return nozzle. 1" barbed bulkhead fitting. 3/4" barbed bulkhead fitting. 1" strainer fitting. Fits all overflow pre-filter systems that accommodate 1" and 3/4" bulkheads. Bulkheads are equipped with double gaskets. Very simple to use and easy to operate.